As he was to do with the Pirelli building, Ponti published his Villa Planchart twice (both times in Domus: first as a design and then again after its construction. He described the principles on which it was based and the results, for he saw the circumstance as almost ideal, and able to set a standard. The client was ideal, a happy client (the client, says my friend Rogers, is the person without whom one cannot produce architecture, and with whom one cannot produce it either. But here, the client has been one with whom it has been possible, to the best of our ability, to produce architecture.). The house now belongs to the Fundacion Anala y Armando Planchart, which has maintained it intact, right down to its furnishings. And this is fortunate, for this work of architecture -a spectacular display of spaces for whoever enters it- has a unique combination of inventions and delights, as rich as the tropical vegetation it incorporates. (Look at the patio decorated by Melotti,and the small internal windows, and the little theatrical balconies that face onto the empty space of the two-story-high living-room, and the doors and ceilings decorated by Ponti.) The principle of this work of architecture - which is the fruit (as the Pirelli building would also be) of the new researches emerging out of Ponti's journeys to Latin America in 1952 and 1953 - is the evidence of the supported surfaces: the non-bearing external walls appear to be detached one from the other, as well as from the roof and ground. This is evident at night as well, for the plans for this work of architecture included what Ponti called a project of nocturnal self-illumination. Without weight or mass (and with the slenderness that Niemeyer has revealed to us), the construction seems to rest graciously on the ground, like a butterfly. 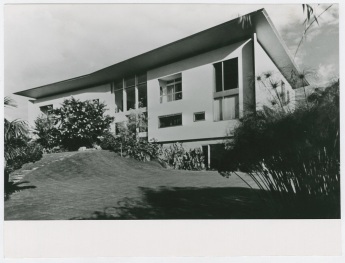 The Villa Planchart was one, together with the Villa Arreaza also in Caracas and the Villa Nemazee in Teheran, of the three villas designed in these years in which Ponti was given full freedom of inventions.